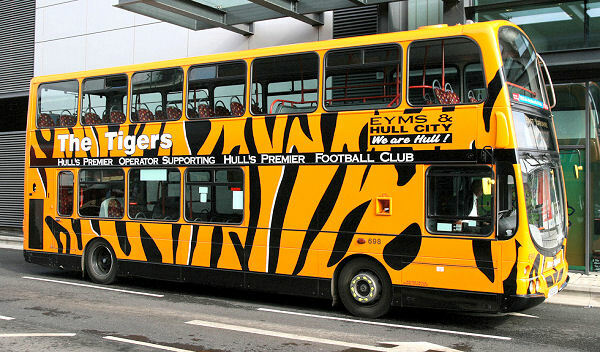 We’re referring of course to East Yorkshire Motor Services’ ‘Tiger bus’, also known as fleet number 698, registration number YX05 EOR. The Volvo B7TL (wearing Wright Eclipse Gemini bodywork) is ‘kitted out’, not in EYMS’s usual livery of burgundy and cream, but in City’s colours of amber and black, and like the 1992/93 home kit it features tiger stripes. 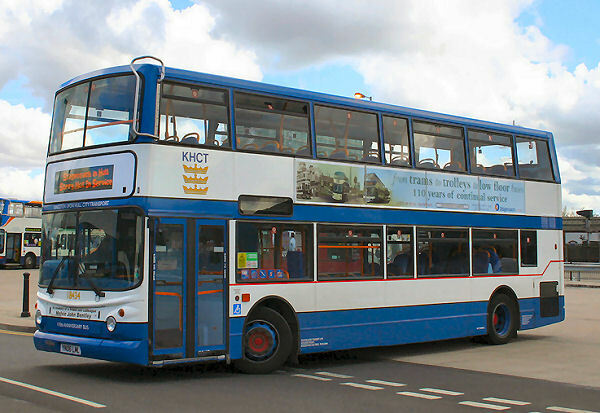 The double decker, in service since 2005, was given a makeover in 2008 to salute City’s promotion to the Premier League and it has stalked the city bearing club colours ever since. 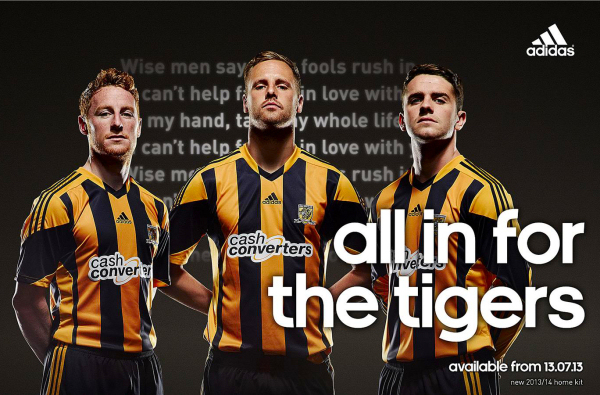 “Hull’s premier operator supporting Hull’s premier football club” reads the blurb along the sides, which is a nice touch, and no matter that City ply their trade outside of the Premier League nowadays, we are still the city’s premier side, ahem. 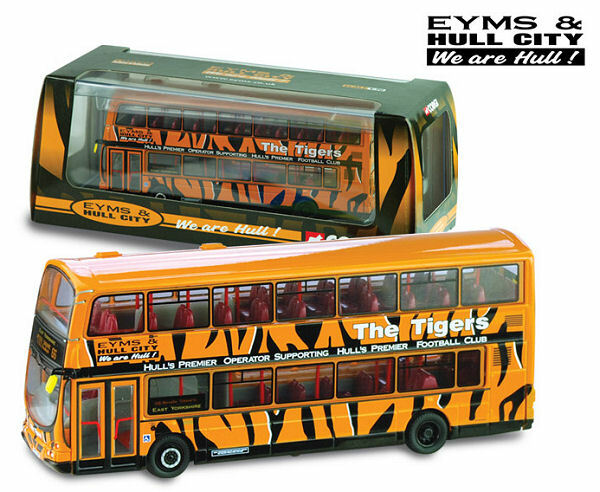 Just as football fans can buy replica shirts, bus ‘enthusiasts’ can buy replica models, and the Tiger bus has been faithfully recreated in 1:76 scale toys that retail for £25.99. Ace. 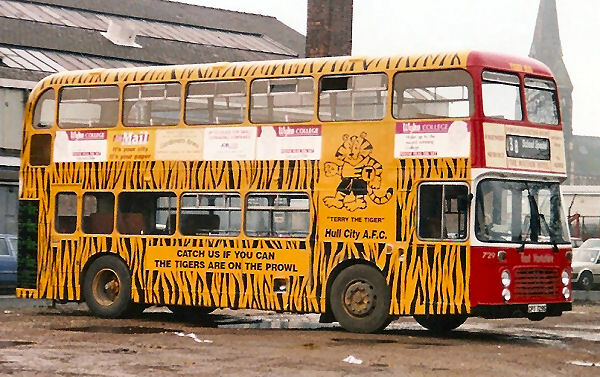 Fleet number 698 is not EYMS’ first tiger striped City themed bus however. 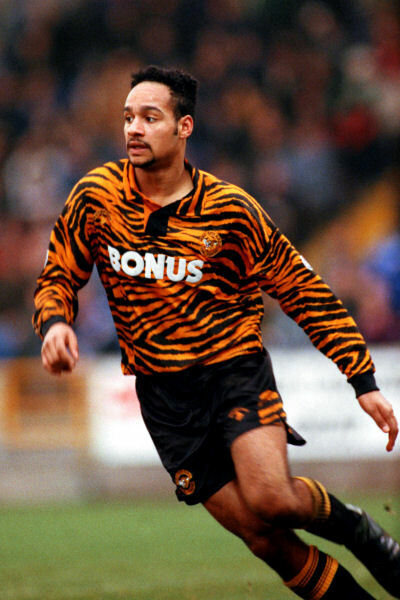 A similarly schemed double decker prowled the town in the mid 1990s, clearly based on the famed home kit of that era. This vehicle, a 1978 Bristol VRT/SL3, had a registration number of CPT 729S and fleet number of 729. From the front, it looked like a regular East Yorkshire red bus (EYMS was privatised in 1987 but retained the National Bus Company red and white livery until the switch to burgundy and cream) but the sides and back were tiger striped. 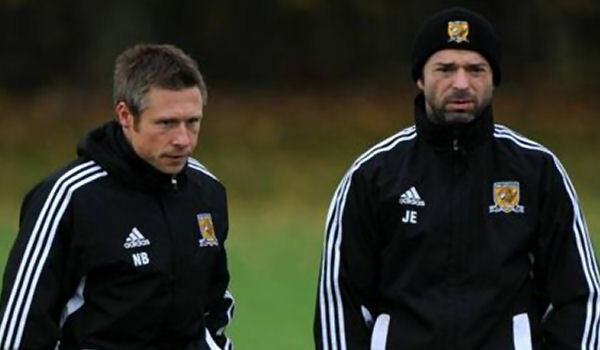 The crossbar section of the T shaped advertising space on either side featured several small ads grouped together, but the upright bar was the home of ‘Terry the Tiger’, an anthropomorphised ball clutching cartoon tiger presumably named after then manager and ire-magnet Terry Dolan. Fleet number 729 was withdrawn from service in 1998 and was sold to Big Apple Tours of New York. We’d love to think that ‘Terry the Tiger’ became a regular sight in Manhattan and Brooklyn, but they probably changed the livery back to red, bah! 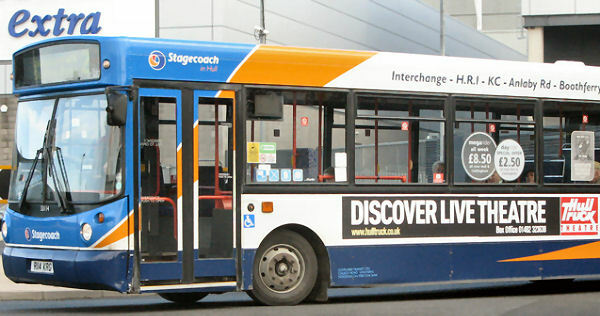 The city of Hull’s other bus company Stagecoach have never gone to the lengths of painting a vehicle amber and black, but they have featured the club crest on at least one bus. 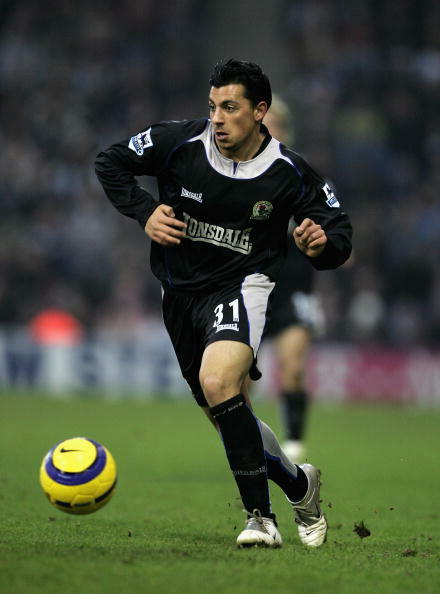 Stagecoach were an ‘associate business partner’ with City for the Premier League years, which is to say they sponsored a few matches, and the bus that regularly went by the KC Stadium after leaving the city centre featured a grey decal on one of the windows advertising the link up. 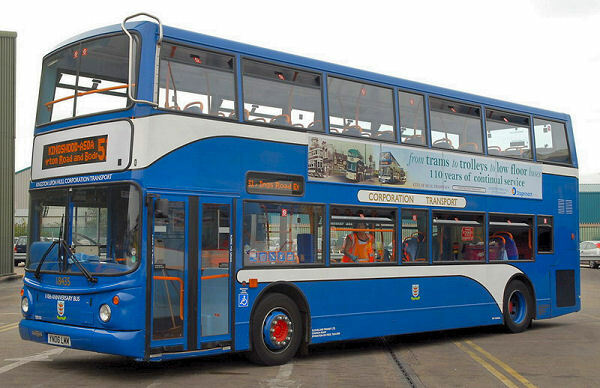 Though not remotely Tigers related, we also applaud Stagecoach for giving two buses a retro look. To celebrate 110 years of providing public transport in Hull, the company gave two vehicles throwback liveries, harking back to when the service was known as Hull Corporation Transport and later Kingston-upon-Hull City Transport (KHCT) before the Council operated company was bought in December 1983 by Stockton-based Cleveland Transit, who were themselves bought by Stagecoach Holdings plc in September 1994.